It’s crazy to think that another fishing season is almost in the books. With that being said, fishing is still going strong here at QCL. Although there is still the odd Chinook being picked up inshore, most boats are now spending the majority of the day working “the salmon highway” along the 300-foot contour line. 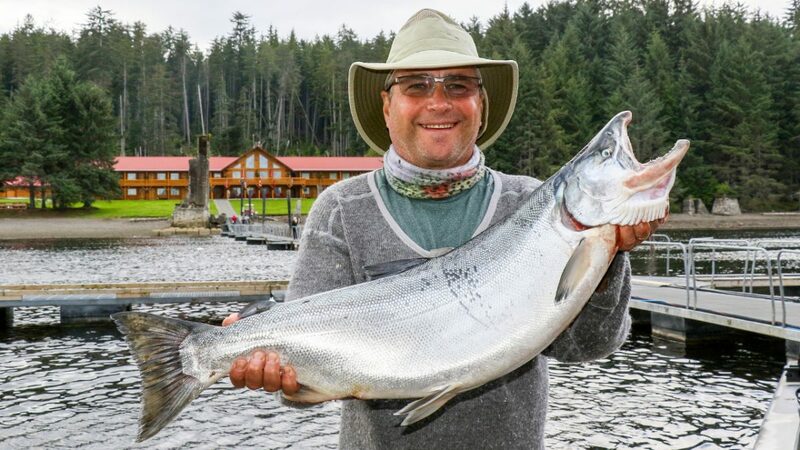 This has resulted in very consistent Coho fishing on a daily basis and on some days the Chinook fishing has been just as good out there, resulting in action-packed fishing days. In that mix of consistent Coho fishing there has been some real lunkers, with several nice mid-teen Cohos hitting the dock last trip. This photo features a gorgeous 17-pounder caught by Arnot T. Congratulations! With the calm waters that we have continued to see lately, many nice halibut continue to be caught on a daily basis. All in all, guests, guides, and everyone else involved seem to be very happy with how things are going out on the water! Today we had a new group of guests arrive for our final weekend trip of the season. Again, the offshore fishing was very productive, especially on the ebb tide. Although the Chinook were fewer in number out there today, a fair number of Chum salmon were caught. These powerful fish often provide an acrobatic and unpredictable fight that our guests really seem to enjoy. With the Coho fishing remaining strong today, there were certainly some real beauties around. The highlight of our day was when one of my guests hooked into a nice fish that took a couple of lengthy runs. I figured that we for sure had a nice Chinook on the line, but to our pleasant surprise it ended up being a large 15 lb Coho. What a fish and what a day!